There may just be whispers about it in the workplace now, but if learning leaders haven’t heard much about gamification yet, they will soon. At the annual National Retail Federation conference held in 2012, gamification was touted as the next form of work-based social media where people interact and socialize around a common bond of knowledge, competitive strategy and fun. CLOs, HR directors, and operations and innovations teams across various industries are integrating gaming into learning and development strategy to drive performance, highlight achievement and boost engagement. But gamification is more than newfangled training. Elements of game play engage employees with new knowledge, encourage competition among peers and bestow public rewards and recognition on those who excel. It can cover just about any topic, including improving operations, cutting logistics costs and challenging employees to understand how their roles contribute to enterprise success. In the future, managers will see people playing games at work. After all, Gen Y professionals have been nurtured and brought up on gaming, and Time magazine reported last year that the average gamer is 37 years old. As boomers reach retirement age, two other generations will make up the majority of the American workforce: Generation X and Generation Y, also known as millennials. It’s important to consider millennials’ role. They have essentially grown up digital, and that has changed how they engage with others in their day-to-day work lives. They come to work expecting the same engagement they find in the digital world. According to technology research company Gartner, by 2014, 70 percent of global organizations will have at least one gamified application; by 2015, 50 percent of organizations that manage innovation processes will gamify them. Many of the world’s largest brands are deploying gamification, including Coca-Cola, AOL, Nissan, Nike and Viacom, and as more studies become available, the advantages to gaming in the workplace will become widespread. Learning leaders who have made the jump are motivated by different things. One primary lever promoting gamification is that employee satisfaction, which is closely related to retention, can no longer be achieved through financial compensation alone. Ultimately, the big-stick approach doesn’t always work, and it is not the only method available to motivate and encourage team efforts. To stay on top of the game, managers must be forward-thinking. The challenge now is in understanding why gamification is so effective and how to introduce it seamlessly into an organization. What follows are the five reasons why leaders can’t ignore gamification and its potential to empower business. 1. Gamification improves knowledge. Most people start learning to play games at a young age, and the human brain is built for game play. Certain functions in the brain organically work toward logical problem solving. Gaming takes this natural process and makes it fun and rewarding. Typically, this requires the player to remember information, make judgments and seek certain outcomes. Knowledge retention is a big part of an employee’s daily life, so promoting the most effective types of learning isn’t just important for the employee, it’s essential to an organization’s growth. 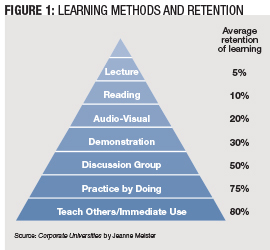 Jeanne Meister, author of Corporate Universities, said that interactive learning games can increase long-term retention rates by up to 10 times — a significant statistic when considering knowledge retention (Figure 1). 2. Gamification gives employees the power to actively gauge their performance. Annual evaluations are a necessary evil, but leaders increasingly find that employees perform better, learn more quickly and correct behaviors when they receive immediate, real-time feedback. Gaming offers an immediate cause and effect. If an employee chooses the wrong path or makes a wrong move in a game, the individual will be immediately corrected. Similarly, if the individual makes a strategically smart move, he or she will receive immediate positive reinforcement. Gamification also offers feedback to the employee and helps to accelerate knowledge retention. This offers companies an advantage because it creates a more efficient and engaging way to monitor progress. Instead of learning the hard way and having to wait for insight from their manager or peers, gamification allows employees to receive feedback immediately. It fosters transparency about how performance is measured and where the employee really stands. For example, in 2007, IBM created a business process management (BPM) simulation game called Innov8. It was originally designed to help develop college students and young IT professionals, but during the past five years, it has evolved into a program that gives both IT and business players a better understanding of the impact of successful BPM on an entire business ecosystem. At its core, Innov8 was created to help people work smarter so they can help build a smarter planet. Players quickly see how practical process improvements can help meet profitability, customer satisfaction and environmental goals while addressing real problems municipalities and businesses face. 3. Gamification boosts achievement across the board. Companies spend thousands of dollars annually sending their employees to seminars, conferences and targeted development sessions. There are benefits to being able to display the fruits of learning achievements via certificates displayed on desks, letters behind one’s name and highlights on a LinkedIn page. People often enjoy competition, and they like to win and receive validation. In the workplace, people are judged on their knowledge, achievements and overall reputation. Allowing employees to become skilled masters in their particular roles and creating a community that openly recognizes their accomplishments will not only facilitate overall workforce development, it will ultimately help an organization reach its business goals. 4. Gamification builds engagement and can promote emotional connections with others. Most people appreciate some sort of social interaction in the workplace. Employees enjoy having lunch partners and playing on kickball teams during company outings, and they may voluntarily spend their off hours at team-building events. People like to feel that they belong and to help others, that they matter and that they are more than a cog in the corporate machine. In 2011, the winner of the SAP Gamification Cup had the idea of gamifying SAP’s vendor invoice transaction. For each invoice and line item, users and their teams can earn points, raise their status and participate in daily or monthly challenges for their team. The reward at the end of the month is a dollar amount that is donated to charity. Gaming creates a virtual world where employees can be productive and still have a good time. Incorporating fun into the workplace can be good for business because it fosters productivity, which helps to create a better work environment. Happier employees often generate higher revenue. 5. Gamification emphasizes learning and development. Many companies are embracing gamification as a way to encourage innovation among their employees. At a 2012 Consumerization of IT in the Enterprise conference, Zichermann described the crowd-sourcing game Foldit, developed by the University of Washington. In 2011, 46,000 people using Foldit worked for just 10 days to determine the structure of a key protein that scientists believe may help cure HIV. Scientists had been working on the problem for 15 years. An organization may not be trying to cure a deadly disease, but fostering innovation can mean life or death in today’s marketplace. Reinforcing learning and development within a team will not only foster a productive work environment, it helps to create opportunities for career advancement and job security for employees down the road. However learning leaders spin it, gamification is a fast, effective and fun way to train and motivate employees. Be on the lookout for it — or better yet, be the pioneer who brings the idea to the company. How do the best get better? Delta Air Lines tackled this challenge with its call center professionals in 2012. Call center employees handle customer needs, upsell additional Delta products and cross-sell partner promotions. Many of these employees were already leaders in sales metrics, but the airline sought further improvements. Delta’s training team partnered with e-learning company NogginLabs Inc. to develop a game-based training program that appealed to the call center professionals’ competitive nature, challenged their skills and engaged the audience by delivering learning that didn’t feel like a required course. The solution was Ready, Set, Jet!, a travel game that presents seven cities across six continents. Delta content is paired with cultural content and enmeshed into the game to the point where no Delta branding is noticeable. By decontextualizing Delta content from the employee’s job role, learners can immerse themselves in gameplay. As players navigate the globe, they access activities and mini-games that allow them to progress toward milestones and achievements. The objective is to climb to the top of the leaderboard, which encourages competition. Applying metrics within a learning game drives engagement and continual play, and the game’s metrics include money gathered and spent, time and miles traveled, learner’s rank, tasks and games competed, cities visited, and an overall score shown on the global leaderboard. To further build the gaming community, Ready, Set, Jet! allows several types of interactions between players, which are administered through the players’ company email accounts. They can challenge each other to a mini-game via email, staking money they’ve earned through the game. Players also can earn souvenirs throughout the game, and have the option to exchange the souvenir for game money or leave it in a city for another player to collect. Within the game, players also can tag their favorite mini-games, adding an element of crowdsourcing similar to that used by many social media platforms. The game’s architecture allows for a living world that continually changes and evolves, and Delta plans to expand the game with new cities in subsequent development phases. Reception of the game has been positive. During the initial launch period of Oct. 1-15, more than 1,400 players voluntarily engaged in the game. Since that time, more than 3,300 challenges have been issued and more than 1,000 souvenirs left for fellow players. In the first two months since the initial launch, Delta call center professionals have voluntarily logged more than 16.2 million minutes of game time, the equivalent of more than 30 years.